Biblical Spiritual Warfare -Ch.4. True Christian spiritual warfare is indirect confrontation - Spiritual Warfare Principles for Every Christian. The book content below is available in paperback & printable downloads at a low donation level price. The latest edition has been extensively revised (updated) beyond this online first edition. 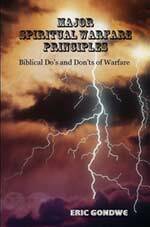 The book is titled: Major Spiritual Warfare Principles: Biblical Do’s and Don’ts of Warfare. Links are provided for its bookstores. “For our struggle is not against flesh and blood, but ...against the spiritual forces of evil... Therefore put on the full armor of God,” Ephesians 6:12-13. By this time, based on the previous chapters, you likely have a solid foundation on understanding the biblical nature of spiritual warfare. With the foundation now in place you’ll be able to build a sound biblical interpretation of spiritual warfare principles that are not diluted with erroneous and harmful teachings. As said earlier, the biblical interpretation of spiritual warfare principles endorsed by this book are supported by the entire 2000 year church history -from Christ’s time up to now. They constitute the old teachings on spiritual warfare and have stood the test of time on doctrinal scrutiny. Nearly all our various evangelical branches (denominations) in the body of Christ endorse the old teachings on spiritual warfare. Read on to find out. So much is at stake. On the other hand, the spiritual warfare teachings that advocate for direct confrontation with Satan have been around only since the 1980s. They constitute the new teachings on spiritual warfare. The doctrinal foundation they’re based on has had controversies ever since the teachings started. This ought to ring a doctrinal analysis bell to any Christian serious enough to walk in truth and in spirit. Many scriptures have literally been taken out of context to establish the new teachings. The new teachings are only endorsed by two or three groups (denominations) among our various evangelical branches. Needless to say that the groups that endorse the teachings have dissimilar versions of direct confrontation with Satan and his fellow demons. Due to their false empowerment these teachings advocating for direct confrontation with Satan have spread with a lot of excitement. Believers learn that scripture admonishes us to directly confront Satan and his fellow fallen angels. It feels great since instead of praying to God we can do it ourselves. We have the divine authority over Satan and demons, so it’s assumed. The false empowerment makes us in charge over evil spirits to the extent that we directly control them ourselves. We all want to have more direct control over our lives. Anything that gives us direct control over our lives empowers us. So now the new spiritual warfare teachings claim we have direct control over evil spirits. We by-pass God and we rule over them ourselves. The only time God comes in is as we use the name of Jesus to bombard the demons. Every matter in life that seems like a spiritual attack is an assumed call for us to directly confront the evil spirits. Instead of praying to God we go after the evil spirits and directly confront them. We confront them over material and financial maters. We confront them over physical health matters. We confront them over relationship matters. We even confront them in geographic territories by waging territorial warfare. The list is endless of how we engage evil spirits directly. Some churches following this belief even encourage preemptive warfare. This is were Christians are to directly attack evil spirits before the spirits strike. Notice that this belief system preoccupies us with evil spirits. Instead of being preoccupied with God we’re constantly looking at what evil spirits are up to. And whatever evil spirits are up to is not God’s responsibility to deal with them but ours, so it’s assumed. It even makes it hard to think of what God is up to in spite of the evil spirits. Thus much time that could have been given to prayer (being preoccupied with God) is given to “discerning” and directly attacking evil spirits (being preoccupied with evil spirits). If you’re like some of us who’ve read the bible from cover to cover you’ll notice that this God we serve prefers us to be preoccupied with him more than anything else. An even worse scenario for this God we serve is where we’re being preoccupied with evil spirits. Such preoccupation is not Christianity but another religion that gives us a focus on and false empowerment over evil spirits. You’re probably familiar with what I’m saying. Some may be saying wait a minute, what about this or that scripture? Please read on, preferably the whole book, if you have many questions and doubts. This book wasn’t written by an armchair umpire comparing two distinct doctrines. I was for years caught up in the false teachings on spiritual warfare. Being a person who goes to extremes on any matter that’s important I aggressively applied the false spiritual warfare teachings. I was one of the most radical followers of the false teachings on spiritual warfare. Being led by the spiritually blind on what true biblical spiritual warfare really is I also ended up being spiritually blind. All the scriptures you may raise I therefore know them. The book is thus coming from an insider who’s intimately familiar with the false teachings on spiritual warfare. God graciously got me out of it and he’s doing the same for you through this book –or through any other way –hopefully not through a severe wake-up call. The false teachings on spiritual warfare sound so empowering. Are they biblical? You’ll see in this chapter that any biblical basis they use is merely misinterpretation of scripture. The bible can be used to back up nearly anything. All that’s needed is taking some scriptures out of context and one has a new teaching or doctrine. Fellow Christians be on alert. Fellow ministers guard your calling in ensuring you’re not blind on an important matter that could make you mislead many. Some new teachings using scriptures out of context can have disturbing consequences on your life and others – spiritually, socially, materially, or physically. Needless to say that there’s always plenty of hope for anyone who may have been harmed by any kind of false teaching. New Age self-empowerment teachings are all around us. Let’s not entertain them when they try to infiltrate Christianity. In fact all occult teachings in both white witchcraft and black witchcraft are centered around self-empowerment. They promise people power over “the” spirits, both good and bad spirits. Through learning some occult teachings they promise self-empowerment that enables a person to use “the” spirits in his/her personal advancement in career, marriage, material gain, and so on. The spirits are claimed to become submissive to one’s requests as a person gains and applies knowledge of certain occult rituals. For example, just look at the degrees or hierarchical levels of Freemasonry and you will see how the occult is centered on self-empowerment. Here are a few and you’ll notice how self-empowering the titles are: Master Mason, Excellent Master, Secret Master, Perfect Master, Master Elect of Nine (ninth degree), Grand Master Architect, Prince of Jerusalem. These are just some of the first 16 Masonic degrees (out of 33). Can you see how they entitle a person to be a master or lord over his/her own life as he/she graduates in the Freemasonry occult disciplines? If this sounds so unfamiliar to you please read my other book, Breaking Occult Spells: Protection from Witchcraft and Occult Influences. It has more detailed info on this topic. The new teachings on spiritual warfare borders on making evil spirits to become submissive to one’s requests. Can you see how this brings a false sense of self-empowerment – like the occult world promises? Direct confrontation on spiritual warfare is being used as a means for having power over evil spirits. It may sound innocent for any unsuspecting Christian but if you connect the dots you’ll see that it has occult relations. This is not to say fellow Christians caught up in the new teachings on spiritual warfare are in the occult. It’s just to say that the new teachings have occult relations on self-empowerment, giving a person power over the spirits. In Christendom select scriptures get taken out of context and the self-empowerment doctrine gets a Christian face. Direct confrontation against Satan and his fellow demons is claimed to empower us to counter their schemes. The main biblical basis being used for direct confrontation on spiritual warfare is that Christ gave us authority over unclean spirits (i.e. evil spirits, demons or fallen angels). This is very true. Yet it’s only true to the extent that our given authority is exercised within its contextual limits that it was granted. All given authority, whether earthly or spiritual, is limited. The only being with unlimited authority is God. His kind of authority is called power because it’s not granted and cannot be sanctioned by anyone. He’s sovereign. God’s angels have limited authority, demons (fallen angels), including Satan, have limited authority. Who are we to think our given spiritual authority is unlimited? Exercising our given spiritual authority beyond its given limits is mere presumption and venturing into unauthorized territory. Once you enter into an unauthorized territory you’re at the mercy of its residents. Satan and his fellow demons have no mercy over believers entering unauthorized spiritual zones. It’ll be free lunch for them –unless God in his sovereignty stops them. Thus our given authority over evil spirits did not mean it was a blank check to go after evil spirits wherever we wish to confront them –in people, in thin air, in geographical territories, in water, in the spirit world, or wherever. This makes understanding the boundaries of our given authority a very important matter. This is particularly important on matters that deal with the spirit world. Otherwise we may risk going outside our boundaries and face regretful counterattacks that could have been avoided. The previous chapters (chapters 2 and 3) cover in depth on our given authority and on its limited boundaries. Please read them in case you came straight to this chapter. You’ll see from God’s word how he has created a God-centered approach to dealing with evil spirits. The rest of this chapter expands on this God-centered approach by elaborating on our role as indirect warriors in God’s army. In other ways, we do not fight evil spirits directly but fight them indirectly by focusing on God who has the power to directly confront them. God, through his angels has the power to directly confront evil spirits in all their set-up places: occult world, spirit world, and territories. Thus victory comes by fulfilling our expected indirect responsibilities, and not by our direct confrontation with evil spirits. Indirect confrontation is our responsibility. Direct confrontation is God’s, except where demons are to be cast out of people. This chapter is an answer to: what is spiritual warfare according to the bible? Or what is Christian spiritual warfare? True biblical spiritual warfare is simply indirect confrontation with Satan our principle enemy. Indirect confrontation implies that we do not fight with Satan and his evil forces by approaching them directly. We confront them by applying indirect means and ways that God has established for us. These will be covered shortly. Applying and fulfilling our required indirect roles secures our standing before God and allows him to directly act on our behalf. Attacks from Satan against us become God's battles as we obey and fulfill the roles required of us. In this spiritual battle God’s role is direct in nature as he is able to directly confront the spiritual forces unseen to our human eyes. God himself does not necessarily fight Satan. He is too big to go out and fight a creature he himself created and allowed to exist after his rebellion. The Lord uses his angels, Satan's equals since Satan is also an angel, only a fallen one. God through his heavenly government of angels has the power, authority and direct access to the kingdom of Satan and his fallen angels. We do not and we only deceive ourselves to assume we do. However, we have a very special role to play in setting the stage for God to send out his angels to minister (carry out) his will. This special role comprises of fulfilling our expected part in our walk with God. The combination of our walk with God and committing life's battles into his hands constitutes our indirect role. God becomes our defender and acts on our behalf in dealing with matters confronting us and the people we commit to him. True Christian spiritual warfare is living a life of consecration, obedience and fellowship with God in such a way that we enable God to effectively deal with the evil working against us and against other people. It is a form of abiding in Christ that overcomes Satan’s legal and illegal grounds against us and others. This is seen in the outline of our spiritual armor given in Ephesians 6:11-18 (outlined below). Biblical spiritual warfare is therefore indirect confrontation against Satan. We approach God to intervene for us against Satan on matters in our lives and the lives of others. It’s true that Satan and his demonic spirits (fallen angels) are our primary enemies we wrestle against. It’s also true that God has given us certain ways in the Bible of confronting these evil beings whose full time ministry is scheming to ruin our lives. Working outside these biblical ways only increases their effect in our lives. One of these non-biblical ways is the assumption that direct confrontation against Satan is our role. Jesus Christ, God made flesh, prayed to God, the Father, for Peter’s deliverance. His spiritual warfare prayer or deliverance prayer was addressed to God not to Satan. How much more should we follow his example of indirect confrontation. The events that followed showed the results of Jesus’ prayers of deliverance addressed to God, not Satan. Peter rose to be the foundation of the early church. His faith in his teacher and master, Jesus Christ, was preserved. God did his spiritual warfare part in fulfilling Jesus’ deliverance prayer by directly confronting Satan in the spirit realm. Some may say direct confrontation with demonic spirits, binding and loosing them became necessary after Jesus ascended to heaven. How come the apostles did not practice it? When confronted with threats that could have closed the emerging church they turned to God. At one point they prayed so much that, “After they prayed, the place where they were meeting was shaken,” Acts 4:31. In our time fellow believers assume earth shaking breakthroughs will come after binding and loosing demonic spirits, familiar spirits, generational spirits, Jezebel spirits, territorial spirits, spirits of division, spirits of unforgiveness, and so on. This only ends up taking us outside our biblical limits. It also ends up summoning demons to interfere with our lives because we confront them in their spiritual territory where only God and his hosts have access to. We have direct access to God when confronted with evil. However we do not have direct access to the spirits of darkness. The previous chapter covers this in depth from God's word. Paul, the apostle whose inspired words on spiritual warfare have confused some, never directly confronted demonic powers. He received a thorn in the flesh from Satan that brought much pain and discomfort in his life. “There was given me a thorn in my flesh, a messenger of Satan, to torment me,” 2 Corinthians 12:7. None of us would like to have a demonic attack that is illegally operating against us. More so for a person of his spiritual stature with one of the greatest anointing on him. He is probably the greatest spiritual warfare prayer warrior in Christian history. His spiritual warfare prayers where addressed to God. He indirectly confronted the enemy. In dealing with the demonic thorn in the flesh Paul turned to God instead of confronting Satan and the ranks of principalities he identifies in Ephesians. He turned to God, not once but, “Three times I pleaded with the Lord to take it away from me,” Corinthians 12:8. If direct confrontation was scriptural we would have seen at least one direct encounter between Paul and demonic spirits. But he kept turning to God, his only source of salvation, who had the authority to directly confront these evil beings in the spirit realm. After covering on all these major biblical cases of indirect confrontation as our avenue of spiritual warfare and deliverance some may still argue about our authority to bind and loose demonic powers. Please read Chapter 2: Our Territory and Nature of Our Spiritual Authority. It explains what binding and loosing is according to the bible. Others may say, we have the authority to directly confront evil spirits by casting them out of people. True and this is one exceptional area that scripture allows us to directly confront evil spirits. Chapter 5: Exception for Direct Confrontation covers on this topic. A single exception on direct confrontation does not justify other practices as means of directly confronting evil spirits. The spiritual amour in the Ephesians passage is composed of Truth, Righteousness, Gospel of Peace, Faith, Salvation, and the Word of God. All these are aspects of consecration, obedience to and fellowship with God. The Lord uses our consecration and obedience to overturn Satan’s legal hold over matters in our lives and the lives of those we’ve been assigned to minister to –spiritually, socially, materially and physically. “We will be ready to punish every act of disobedience once (when) your obedience is complete,” 2 Corinthians 10:6 (emphasis added). God stands as the highest Judge who takes up our cases as we submit them to him to bring justice. Our cases are already in our favor because we use the work of Christ and his blood atonement (sacrifice) for all humanity and matters in life to justify our cases. Our consecration and obedience to God enables the Holy Spirit to effectively work through us in punishing all the disobedience the enemy brings or attempts to, in our lives and the lives we’re commissioned to serve. The term spiritual warfare itself is not in the Bible. It is still relevant since it distinguishes between spiritual and physical warfare. Its closest association is the passage in Ephesians 6:11-18. Unfortunately the enemy has used it to deceive us that we have the right to directly fight his set-up in the heavenly realms. The lie is not new since Satan has throughout history used scripture to justify ungodly acts such as gender abuses, slavery, colonialism, persecution of non-Christians and so on. The passage in Ephesians says, “For our struggle is not against flesh and blood, but against the rulers, against the authorities, against the powers of this dark world and against the spiritual forces of evil in the spiritual or heavenly realms. "In addition to all this, take up the shield of faith, with which you can extinguish all the flaming arrows of the evil one. Take the helmet of salvation and the sword of the Spirit, which is the word of God. And pray in the Spirit on all occasions with all kinds of prayers and requests. With this in mind, be alert and always keep on praying for all the saints,” Ephesians 6:11-18. You’ll notice that the entire armor of God is a call to a life of consecration, obedience and fellowship with God - truth, righteousness, gospel of peace, faith, salvation, word of God, prayers. It is not meant for us to go out and start bombarding the spiritual forces of evil in the spiritual or heavenly realms. Paul used the metaphor of an armed Roman soldier, in showing how we can be prepared for spiritual warfare. In his time, a well-armed soldier wore a belt, breastplate, shoes, shield, helmet and carried a sword. What a difference with our time when a few individuals can destroy the world many times over just by pressing buttons for nuclear and biochemical weapons. God forbid, though the battle of Armageddon is more than likely to feature this. If God placed no limits on Satan we’d all be cooked up by now. Satan would have quickly worked on his schemes to destroy God’s creation. Our God still reigns and has his final say over matters on earth. Wheew! The same mighty God has placed spiritual weapons in our spiritual hands that he says are mightier than human weapons. We have access to spiritual buttons that can devastate the devil’s work against humanity. Their indirect nature may look so simple but as we apply them they set the stage for our mighty God to directly overcome the devil’s work against us and against all humanity. The following outlines our primary spiritual armor that has so much power in the realm of the spirit. Appendix 1: Weapons of Spiritual Warfare lists more of our spiritual weapons. We are to walk in truth in our motives, desires and conduct. Truth has scripture as its foundation. The scripture enables us not to live in error, deception, and sin if we apply it in our lives. Truth is not relative or circumstantial but unchanging. It is based on the unbreakable scripture. It cannot be used for selfish motives such as to gain material wealth, influence and so on. There is also no room for “white lies,” deception or exaggerations. Walking in truth works as a weapon against Satan’s deceptions, appeal to selfish desires and the flesh. It enables us to walk according to the will of God. No direct confrontation against Satan required yet his legal entry attempts are overcome as we walk in truth. The belt of truth is among our major indirect weapons of spiritual warfare and deliverance ministry. Righteousness is a state of living that enables us to be approved before God. He is holy and desires holiness as his standard of approval. Any lukewarmness is unacceptable, like the church in Laodicea. “Because you are lukewarm--neither hot nor cold -I am about to spit you out of my mouth,” Revelation 3:16. Although it is the righteousness of Christ (2 Corinthians 5:21) that makes us acceptable to God scripture is clear that we are expected to walk in holiness. It is a way of fulfilling our part in the call to righteousness. “Those who belong to Christ Jesus have crucified the sinful nature with its passions and desires. Since we live by the Spirit, let us keep in step with the Spirit,” Galatians 5: 22-25. The sinful nature crucified in our lives is what enables the righteousness of Christ to compensate for all the areas we may unwillfully fall short. Without doing our part the righteousness of Christ is in vain. It is degrading the grace of God as a license to sin. On the other hand, when the sinful nature is crucified in our lives it enables the righteousness of Christ to overcome the legal grounds of Satan against us. God becomes our defender in Satan’s accusations against us. He finds us blameless for Satan to have any claim to attack us. No direct confrontation against Satan required yet his legal entry attempts are overcome as we live righteousness lives. The breastplate of righteousness is among our major indirect weapons of spiritual warfare and deliverance ministry. Inner peace is not found among those living outside the will of God. They are very poor in this area regardless of whatever some may have achieved. “The wicked are like the tossing sea, which cannot rest, whose waves cast up mire and mud. ‘There is no peace,’ says my God, ‘for the wicked.’” Isaiah 57:20-21. Because their eyes are still blind they look in all the wrong areas trying to find it –worldly pleasures, entertainment, alcohol, pursuit of riches, fame, power and influence. Many of us were once there, constantly running from something or towards something all in pursuit of peace. Now we have the Prince of Peace living in us without resorting to alcohol, worldly pleasures and so on, to look for peace. God has now given us the shoes of the gospel of peace to “walk” to people without peace. We reveal to them the gospel of peace that brings true peace in their lives. The shoes of the gospel of peace also protect us from the rough ground that we walk on. The ground we walk on is the earth with all its problems that resulted from sin since Adam and Eve fell. There is much poverty, disease, greed, crime, immorality, wars, conflicts and so on. Without wearing our shoes we will have no peace walking in such territory. We will have no peace with ourselves, with God and with others. e) When believing in matters one may find difficult to understand or difficult to draw much sense out of them – e.g. the God of love in a troubled world, bad things happening to God’s people, the trinity, etc. Faith is probably the most important area that Satan targets most among believers. He knows that once we stop trusting God in a particular area he can easily offer us his deceptive solutions. He did that to Adam and Eve. The whole creation is still paying the price. The whole earth is still groaning from what it is being subjected to after Adam and Eve surrendered their inheritance to Satan. In our own lives most of us succumbed to Satan’s lies at one point or another. We knew what God’s word says. However we still believed the lies were more worthwhile to follow. Satan may not have come in a serpent form yet he still came into our thoughts directly or through the media, through a person or through circumstances. The moment we stopped trusting scripture our faith in God’s word in the area of concern ended. The consequences are always the same – negative. Walking by sight or according to the flesh is costly in the long run. On the other hand walking by faith enables us to receive rewarding results in the long run. In the short-run it may seem costly, slow and unconventional. However the rewards are worth the wait if we are willing to trust God for as long as it takes. Walking by faith extinguishes “all the flaming arrows of the evil one,” (verse 16). The flaming arrows include Satan’s temptations, doubt, fear, despair and confusion. He will try to bring them through all sorts of ways – directly into our thoughts or through the media, through a person or through circumstances. We refuse to compromise for anything that is contrary to God’s word. We trust his word even when the shortcut appears rewarding or when we cannot see how it will work out. In this way we are lifting up the shield of faith against Satan’s attacks. There is no direct confrontation yet Satan is overcome as we fulfill our indirect role God has assigned us. Our salvation through Christ is the only treasure we will take with us after we die. Without it we would be heading for hell. It is the only treasure that the devil cannot take away from us. Like with Job, the Lord may allow him to take everything from us. Yet for as long as we remain trusting and having faith in God our salvation remains intact. Even if all fails we know the place God has prepared for us is better than the brief experiences on earth. When Jesus “was led by the Spirit into the desert to be tempted by the devil,” (Matthew 4:1) he used scripture to overcome Satan’s temptations. Scripture is our best offensive weapon against the devil, over our lives and the lives of others. Notice in the temptation passage (Matthew 4:1-11) that Satan also used scripture in trying to deceive Jesus. The passage where Jesus quoted scripture to overcome Satan’s temptations has sometimes been used to justify verbal confrontation. It is often used as an example of verbal confrontation where Jesus exercised the word, the Sword of the spirit realm, against Satan. A closer look shows that scripture does not support this. Satan appeared physically to Jesus in the wilderness (Matthew 4:1-11). It is fitting that he would talk to a being that appeared physically. The devil even took Jesus on a “tour,” first to the temple, then to a high mountain. After this experience there is no other account of Jesus quoting scripture to Satan as a way of fighting him. Yet throughout his ministry he was busy confronting and overcoming the enemy in the lives of people. Thus unless the enemy appears to any one of us physically (God forbid) we have no business talking to him verbally. Even if he were to physically appear to any one of us God may require us to do something else –like just saying, “Away from me, Satan,” (Matthew 4:10). No long verbal confrontations. Quoting any scripture may not be necessary. Our Lord was not setting a formula of using scripture in having conversations with the enemy. What we learn from his experience is that the enemy can use scripture that God gave us to live by. It’s only that he twists it in order to deceive us. The way this deception works is by him planting thoughts in our minds rather than appearing physically. The battle is either lost or won from within as we counteract the temptation and deception with the right scripture -the sword of the spirit realm. Since Satan can also use scripture it becomes a bigger battle when comparing what’s true and what’s twisted out of context. We have more than enough experiences throughout history where God’s people have fallen to lies through misinterpreted scripture. Satan used scripture to justify ungodly acts such as gender abuses, slavery, colonialism, persecution of non-Christians and so on. Our recent accounts include the erroneous spiritual warfare and deliverance teachings. None of the people that fell to the lies throughout history had any outward conversation or physical encounter with Satan quoting scripture. Scripture does not direct us to be quoting scripture against Satan in verbal confrontations and assuming that we’re wielding the sword of the spirit. The battle is within not outside. God’s word hidden in our hearts and minds surfaces whenever we’re confronted with opposing beliefs and matters. God’s word in our hearts and minds is among our major indirect weapons of spiritual warfare and deliverance ministry. Other passages that cover on the armor for spiritual battle include 1 Thessalonians 5:8 and Isaiah 59:17. In 1 Thessalonians 5:8 faith and love comprise the breastplate. Associating the weapons of spiritual warfare to specific areas of the Roman armor is therefore less important than knowing the weapons and using them. 1 Thessalonians 5:8 shows that love is among the major weapons of spiritual warfare. Like the rest, it is an indirect weapon. The article on the “weapons of spiritual warfare” given in Appendix 1 also shows how the matters we exercise in our fellowship with God act as indirect weapons against Satan. Direct confrontation with Satan takes us into forbidden territory in the realm of the spirit. It is not spiritual warfare. It is what scripture calls spiritual slander of “celestial (heavenly) beings,” and which it says brings trouble on the slanderers (Jude 1:8-10, 2 Peter 2:10-12). Neither is direct confrontation a form of deliverance ministry. It is demonic ministry. SpiritualWarfareDeliverance.com, a spiritual warfare & deliverance website of Jesus Work Ministry. New sites now at ChristianWarfare.com & DeliveranceMinistryBooks.com. Sharing major biblical keys on do’s & don’ts of spiritual warfare and deliverance. The main & official ministry website for all the various websites of Jesus Work Ministry is at JesusWork.com. It has the official contact info & other administrative info for all the websites, and entire ministry.